4. Questions and Answers: Wildcat strike. You might judge the age and geographical origin of a dictionary by looking up the definition of this word. Modern ones, especially those with an American focus, are likely to tell you it’s the name of a medium-hot chilli (though, being American, they will spell it chili). Older ones, especially British, will more commonly say it’s the knob on the back end of a muzzle-loading cannon. 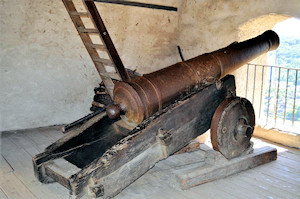 A cannon with its cascabel. The most famous association of cascabel is with the Victoria Cross, the highest British honour for bravery. It has often been claimed that all the crosses ever awarded have been cast from the bronze cascabels of two cannon captured from the Russians during the Crimean War of the 1850s, though recent research has thrown doubt on this. From journey far An English MP, Sir Peter Bottomley, having discussed word origins over dinner, asked me to clarify. Could I confirm that tundra doesn’t come from Finnish? A hunt in the dustier corners of my online and offline libraries turned up the information that the word was imported from Russian in the early nineteenth century (the OED says 1841, but that entry is old and I found it in a travel work, Narrative of a Pedestrian Journey through Russia and Siberian Tartary by John Dundas Cochrane, dated 1824). Captain Cochrane spelled the word the French way, as toundra, and some further delving confirmed that the word was known in French before English. It may have been imported from that language, though parallel introduction is also possible. Russian got the term from the Sami people, who live in northern Norway, Sweden, Finland and western Russia. The direct source was Kildin Sami, spoken around Kola, near Murmansk. Though Sami belongs to the same language family as Finnish and tunturi in the latter language is related, the source of tundra isn’t Finnish. So transmission was from Sami to Russian and then to English, possibly via French. As an aside, tundra is the only word in English which is known for sure to derive from Sami. Medical curiosity I recently mentioned the anatomical snuffbox, a small depression on the wrist that was once a convenient place to put a pinch of snuff for snorting up one’s nose. I’ve now found another odd medical term, waiter’s tip for a neurological condition that’s caused by damage to one of the nerves in the neck. The arm is limp and the elbow straight but the wrist is bent over. It reminded doctors of the posture of a waiter taking a backhanded tip. The official name seems to be Erb’s palsy. Q From Desmond Klein: Where did the phrase wildcat strike originate? That it means an illegal strike of some kind is known, but I cannot find out where it originated. Unions in all the building trades are rapidly voting in favor of the proposed Structural Building Trades Alliance of America, which aims to combine 500,000 workers in one compact body. The object is to put a stop to “wildcat” strikes. Daily Gazette And Bulletin (Williamsport, PA), 19 Apr. 1904. It’s a late example of an idiomatic phrase that includes wildcat. In Europe this refers to a wild variety of the domestic feline, but in North America it’s been applied to a couple of larger cats. One is the Canadian lynx; the other has more names than any one species surely has a right to — among them puma, mountain lion, catamount, cougar and panther. In Britain, wild cat became a term for a savage, ill-tempered, or spiteful person and this sense was carried over into North America but became attached to the native big cats of the continent. In the nineteenth century it extended to any untamed or unreliable person, or someone who undertakes a risky or unsafe project, especially one that preys on innocent people. The earliest use from which all others followed was wildcat bank. Such banks flourished in the period before 1863 when states were allowed to set them up. They issued banknotes; at the time, these were promissory notes, convenient IOUs exchangeable at the issuing bank for real money called specie — coins, especially gold. Some technically still are — over the signature of the chief cashier, Bank of England notes quaintly say “I promise to pay the bearer on demand the sum of ...”. Banks frequently issued far more banknotes than they had capital to redeem them. A run on the bank could ruin them and many ended their short lives that way. We have had nearly sixty new Banks start into operation within about the last three months. They are called the “Wild Cat Banks” — the notes they issue are called “Wild Cat Money” — our state is full of it; if you take Five dollars to-day, perhaps to-morrow, four of the five may be good for nothing — a dollar in specie is almost as rare as a swallow in mid-winter. Rutland Herald (Rutland, Virginia), 20 Mar. 1838. Some thirty banks or more were the fungous growth of the new political hot-bed; and many of these were of course without a “local habitation,” though they might boast the “name,” it may be of some part of the deep woods, where the wild cat had hitherto been the more formidable foe to the unwary and defenceless. Hence the celebrated term “Wild Cat”. A New Home — Who’ll Follow? or, Glimpses of Western Life, by Caroline Matilda Kirkland (Mrs Mary Clavers), 1839. A writer to the New York Tribune in April 1841 sarcastically outlined rules for a successful new bank, among them that its grand offices should be in the middle of town but that “Redemption [was] to be somewhere in the backwoods that a catamount could not climb to without breaking his neck”. Later in the century, the term was applied more widely and loosely, for example to an extra train running outside the normal schedule, to itinerant theatrical troupes who picked up engagements as they toured and to distillers of moonshine whisky. It came most commonly to be used (as it still is) for speculators who explored for oil away from areas of known reserves. When an operator goes into an undeveloped field, and puts down a test well, he naturally desires to have the profit of his risk. It costs him something like $6,000 to put down that wildcat well, for which in most cases, he gets no return, for the majority of wildcat wells produce nothing. The Sun (New York), 17 Jul 1883. The rare successful finds were wildcat strikes, which by their nature were unexpected. This last term began to appear in print in the early 1900s and it seems it was almost immediately transferred, possibly unconsciously but perhaps as a bitter joke, to a sudden and undisciplined downing of tools. Last modified: 22 October 2011.